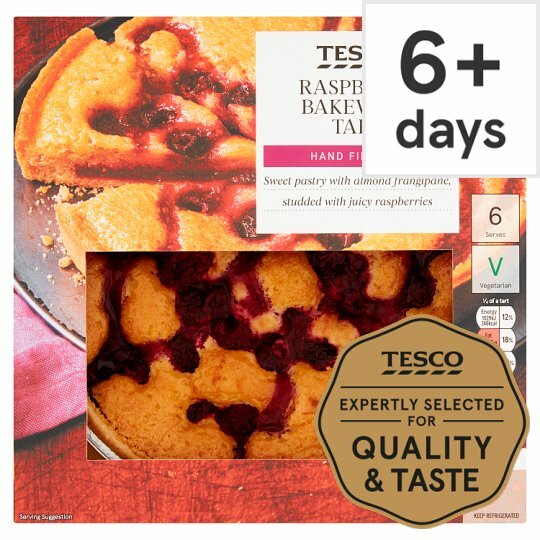 Shortcrust pastry case filled with ground almond frangipane and raspberry sauce, topped with raspberries and a sweet glaze. Hand finished Sweet pastry with almond frangipane, studded with juicy raspberries. Sugar, Wheat Flour (Wheat Flour, Calcium Carbonate, Iron, Niacin, Thiamin), Raspberry (16%), Rapeseed Oil, Pasteurised Egg, Margarine, Butter (Milk), Ground Almonds (3%), Maize Flour, Cornflour, Lemon Juice, Gelling Agents (Amidated Pectin, Pectin), Glucose Syrup, Flavouring, Acidity Regulators (Citric Acid, Calcium Lactate), Stabiliser (Disodium Diphosphate). May contain peanuts and other nuts. For allergens, including cereals containing gluten, see ingredients in bold. Instructions: From chilled: 180°C/Fan 160°C/Gas 4 30 mins Place on a baking tray in the centre of a pre-heated oven. Leave to stand for 1 minute before serving. Cut foil tray for ease of removal.